The Villa is located within The Resort Community of Sea Horse Ranch. 4 Family Suites for 14+ Guests. 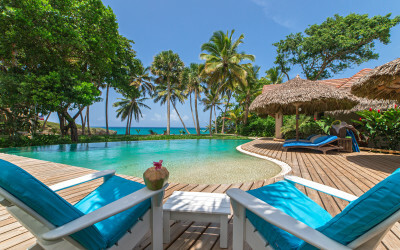 Villa Windsong is a luxury beach front villa located within the gated secure resort community of Sea Horse Ranch and on the north coast of the Dominican Republic. Wind Song is a fabulous compound for groups of 14+ guests wanting to experience that ultimate Caribbean beach retreat with their friends or family. Lush tropical vegetation and countless palm trees blends perfectly with its secluded beach giving an exclusive and private setting for its guests. From the villa's four luxury suites, airy interiors to its outdoor walkways and a beautiful swimming pool creates a very exclusive and a special place. Villa Windsong enjoys great sea views, powder soft sand is only a few steps away from the villa's lawn. The swimming pool commands spectacular view of the beach and the turqouise waters of the Caribbean. There is a gazebo a perfect place for yoga or meditation or can easily transform as your own private Coco Bar at sunset. Both the dining room and living room have open and airy luxurious ambiance. The fabulous gourmet kitchen is complete with everything you need and has an amazing direct view to the ocean. This magnificent home has four oversized family lsuites with ensuite baths. One of the master suites includes a king size bed and two single day beds. The second master suite includes a king size bed and a separate bedroom with two single beds. Both comfortably accommodate four adults. One of the junior suites can be configured for four singles or for one king size bed and two singles. The second junior suite is equipped with a king size bed. Childrens beds are available as well as additional single beds that can be added as required. For groups of more than 14 guests and at an added expense an adjacent luxury villa is also available for up to 25 guests. This neighboring villa offers between two and five additional guest suites with en suite bathrooms. The villa is maintained to the same high standards as Wind Song. Ask us for a customized quotation for expanded groups. Villa Windsong offers a choice of a full staff rental or a partial staff rental. "Fully Staffed" rental offering includes a Tropical Continental Breakfast "set-up" as well as dinner service each night of your stay. No lunch service is offered, however lunch is offered at the Sea Horse Ranch Beach Club (delivery available) and you are encouraged to visit many other fine local dining establishments. The villa is ideally situated for long beach walks, exploring crystal clear tidal pools or adventure into the deep blue waters. For those adventurous and skilled athletes, snorkeling, swimming, stand-up paddle boarding, windsurfing and surfing are only steps away. There is a tennis and equestrain center for sports minded guests who do not embrace the sea. The nearby beach towns of Sosua and Cabarete offer an array of activities, shopping, entertainment and a host of International dining options. - Secure Gated Community featuring an equestrian center, tennis facility and private Beach Club with on site fine dining restaurant. - Located only a ten minute drive from Puerto Plata International Airport (POP). - A tranquil peaceful setting only a few minute drive to the beachfront towns of Sosua & Cabarete. Current exchange rates define the final Euro price. All rentals are subject to a $200 per night service fee which covers all staff gratuities and other service related expenses.